I have previously posted on the slowly eroding chronic expanding MS lesion. Danny Reich’s team at the NIH have convincingly showed how these lesions differ from other lesions that regress over time. The expanding lesions has a rim of macrophages/microglia on their edges that are actively phagocytosing, or eating, myelin. These lesions are characterised by a prolonged rim of Gd-enhancement and dark rim on MRI that occurs due to in accumulation of iron in macrophages/microglia. These lesions are also more destructive with a tendency to leave being black-holes, which we know are associated with more loss of axons. The pathological study below shows that these lesions are not found (or rarely found) around remyelinated shadow plaques. Iron rims were due to pro-inflammatory activated microglia/macrophages and only very rarely in astrocytes. These lesions don’t seem to have prominent T-cell infiltrates; it is as if the macrophages/microglia in these lesions have become independent of T-cell inflammation. Are these microglia dysregulated or are they responding appropriately to something in the surrounding tissue. One of the current hypotheses is that progressive MS is due to ‘hot microglia‘; the chronic expanding lesion may be the substrate for how microglia lead to progressive MS. These lesions are unlikely to respond to conventional DMTs, which typically target the adaptive (memory) and not innate immunity (hard-wired). To address this aspect of MS pathology will need CNS-penetrant drugs that target macrophages/microglia. Dal-Bianco et al. Slow expansion of multiple sclerosis iron rim lesions: pathology and 7 T magnetic resonance imaging. Acta Neuropathol. 2016 Oct 27. Background: In multiple sclerosis (MS), iron accumulates inside activated microglia/macrophages at edges of some chronic demyelinated lesions, forming rims. 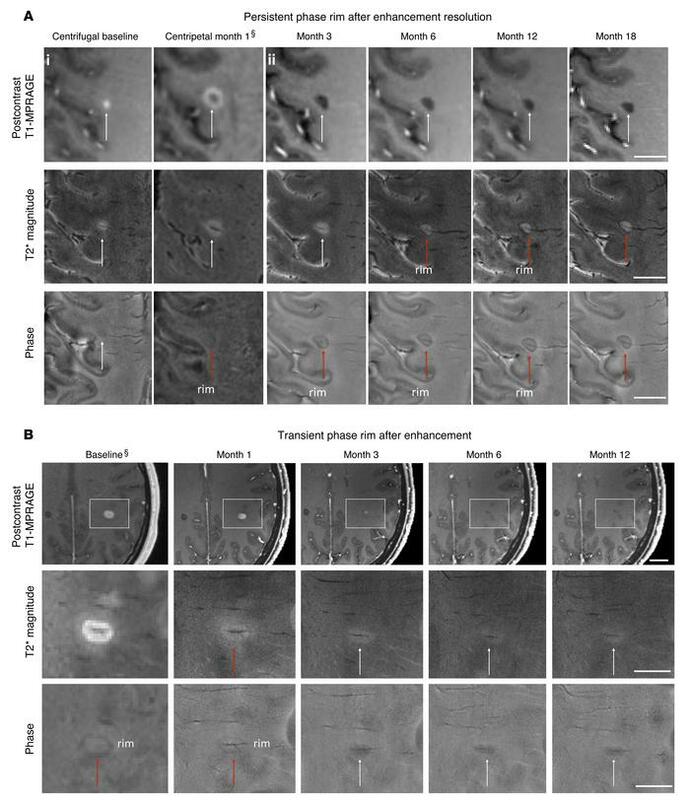 In susceptibility-based magnetic resonance imaging at 7 T, iron-laden microglia/macrophages induce a rim of decreased signal at lesion edges and have been associated with slowly expanding lesions. Aims: We aimed to determine (1) what lesion types and stages are associated with iron accumulation at their edges, (2) what cells at the lesion edges accumulate iron and what is their activation status, (3) how reliably can iron accumulation at the lesion edge be detected by 7 T magnetic resonance imaging (MRI), and (4) if lesions with rims enlarge over time in vivo, when compared to lesions without rims. Methods: Double-hemispheric brain sections of 28 MS cases were stained for iron, myelin, and microglia/macrophages. Prior to histology, 4 of these 28 cases were imaged at 7 T using post-mortem susceptibility-weighted imaging. In vivo, seven MS patients underwent annual neurological examinations and 7 T MRI for 3.5 years, using a fluid attenuated inversion recovery/susceptibility-weighted imaging fusion sequence. Results: Pathologically, we found iron rims around slowly expanding and some inactive lesions but hardly around remyelinated shadow plaques. Iron in rims was mainly present in microglia/macrophages with a pro-inflammatory activation status, but only very rarely in astrocytes. Histological validation of post-mortem susceptibility-weighted imaging revealed a quantitative threshold of iron-laden microglia when a rim was visible. Slowly expanding lesions significantly exceeded this threshold, when compared with inactive lesions (p = 0.003). Conclusions: We show for the first time that rim lesions significantly expanded in vivo after 3.5 years, compared to lesions without rims (p = 0.003). Thus, slow expansion of MS lesions with rims, which reflects chronic lesion activity, may, in the future, become an MRI marker for disease activity in MS. Does the situation with Alzheimer's bare similarities? Great post! I look forward to more research on "hot" microglia/macrophages. Ibudilast is currently in late stage trials for MS and has been fast tracked by FDA. It works as a phosphodiesterase inhibitor on "activated" microglia, promotes growth factors and inhibits macrophage migration. So why does most research in progressive MS focus on B and T-cells despite their minimal effectiveness in treatment of progressive MS and their almost complete paucity in the grey matter in brains of progressive MS patient on autopsy? I would predict that Ibudilast will be much more efficacious than Ocrezulimab (23% above placebo) and Siponimod (21% above placebo) in treatment of progressive MS patients. I didn't think in Ibudilast, but it's founded that Aspirin can act, even though to a lesser "degree", on the microglia? Yes Cinara, I've been banging on about this for years. They haven't yet looked "deeply" at Acetylsalicylic Acid because it's very cheap, generic, "no prospect of exorbitant profits". Have done any studies for progressive MS with Aspirin? I don't feel much fatigue, yet, but I only know that when I feel fatigue and take an Aspirin the disposition seems to return. And those who use Tecfidera generally take an Aspirin before to try the side effect of flushing. Could the neuroprotection action aimed at Tecfidera be potentiated by Aspirin?